Most commercial cleaning solutions contain synthetic chemicals that have unpleasant odors and may come with health risks, especially to individuals with skin sensitivities or allergies. There are, however, some very effective non-chemical alternatives you can try that use ordinary household products. A vinegar-based cleaner is very easy to whip up batches as an effective DIY green cleaning product, and it is a great multitasker. With its powerful cleaning and disinfectant properties, this vinegar cleaner rivals any commercial cleaner fo effectiveness and can be used for cleaning all around your home. Scent it as you please with a variety of all-natural essential oils, which are environmentally friendly and biodegradable. Your imagination is the limit! Vinegar is a natural by-product of plant fermentation; the household vinegar you buy is a mild solution that contains 5 to 10 percent acetic acid. For this reason, it is very effective at breaking down molds, grease, and bacteria—substances that make up many household stains. The acidity of vinegar also serves as a mild antiseptic that hinders the growth of some bacteria. Its acidic nature also makes vinegar effective at dissolving mineral-based deposits, which by nature are alkaline in composition. This recipe makes 8 ounces of mixed solution, so multiply the ingredient amounts as needed to fit the size of your spray bottle. Also, this recipe creates a solution that is a 1:1 ratio of vinegar to water. This is a good ratio for most cleaning projects, but for very tough jobs, such as cleaning excessive mold and mildew, you can increase the potency of the solution by changing the vinegar to water ratio to 2:1 (2/3 cup vinegar to 1/3 cup water, for example). Choose one or a combination of essential oils. Using a measuring cup and funnel, add the vinegar and water in the desired ratio, and shake to mix them together. Add the essential oils directly to your spray bottle. Shake the bottle to incorporate the essential oils. Label the bottle with a permanent marker. Store the bottle out of direct sunlight or heat, which can change the chemical constituents in the essential oils. Other essential oils you might want to try to include basil, bergamot, cinnamon, clove, eucalyptus, grapefruit, lime, oregano, rosemary, and thyme. The low pH and acetic acid content of vinegar hinder the growth of microorganisms. Vinegar cleaner is, therefore, a mild antiseptic, though it should not be regarded as a broad-spectrum disinfectant. Also, the essential oils add additional antibacterial, antiviral, and antifungal qualities to your all-purpose cleaner. Finally, the high acidity level of vinegar serves to loosen mineral deposits, such as lime and calcium and will help dissolve soap scum. For tough cleaning jobs, let the spray sit for several minutes. For mineral build-up around fixtures or excessive mildew in the shower, give this spray a few minutes to work before cleaning with an old, soft-bristled toothbrush or scrub brush. Then rinse well. To disinfect surfaces such as countertops, let the spray sit for at least 60 seconds before rinsing. For scrubbing action, try first sprinkling some baking soda in the sink, bathtub, shower, toilet, oven, or on the cooktop. Then, use the vinegar spray to dampen the baking soda, which will create a paste. Scrub away with an eco-friendly sponge or scrubbing tool, and watch as the built-up soap scum, dirt, odors, and mold disappear. To clean mirrors, simply spray on the vinegar cleaner and buff it dry with a natural, soft, lint-free cloth, such as an old T-shirt or a cloth baby diaper. To eliminate odors, use this spray as an air freshener. Vinegar is a natural deodorizer. Don't ever mix vinegar with bleach. It will create toxic chlorine gas. Before using vinegar-based cleaning products, do a mental check to make sure you haven't mixed it with any bleach-based cleaning products you may have forgotten about, such as drop-in toilet bowl cleaners or bleach cleansers. Combining the two can be highly dangerous. Vinegar can irritate your eyes if contact occurs. Flush liberally with water for 5 to 10 minutes if the product gets in your eyes. It is important that you use essential oils safely. If you get essential oils in your eyes, flush with water for 10 to 15 minutes. Consult a doctor if irritation persists. If you get essential oils on your skin, wash with soapy warm water. One exception: Lavender doesn't harm the skin; in fact, it is often used directly on the skin to treat burns, insect bites, and more. Vinegar can break down latex grout if it is left on too long. Do not use vinegar cleaners on marble, granite, and other natural stones, such as those used in countertops and floors. The acids in vinegar can dull and etch stone surfaces. 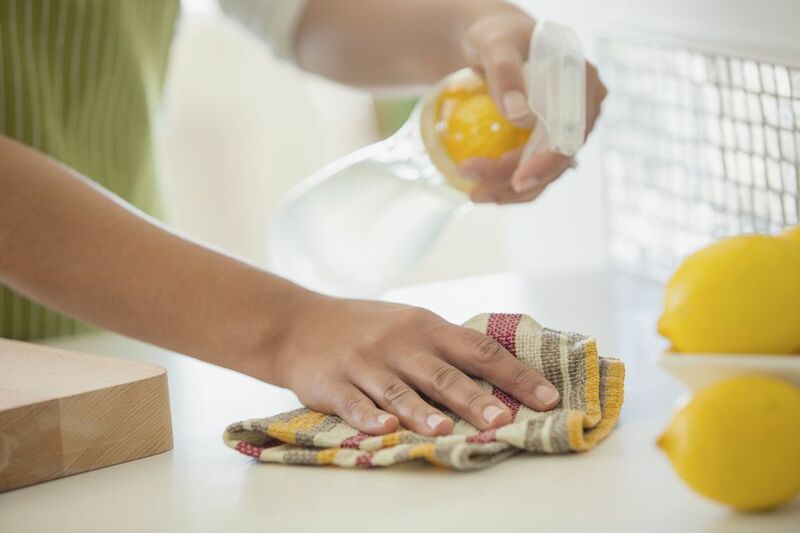 Don't clean up raw egg spills with vinegar cleaner. It will cause the liquid egg to coagulate and make it harder to clean up. Be careful when using vinegar cleaner on hardwood floors. Test it first in an inconspicuous area. Some finishes may be damaged by vinegar. Although clothes irons do collect mineral deposits, most manufacturers warn against pouring vinegar or vinegar-based cleaners through them to remove mineral build-up. Read the instructions to determine how best to remove mineral deposits from your clothes iron.